You can also connect your phone to your car by installing a new car radio. See our Car Stereos page. We carry the major name brand of our industry, PAC, iSimple, Axxess by Metra. Stop by today. No appointment needed. Expert Installations daily. 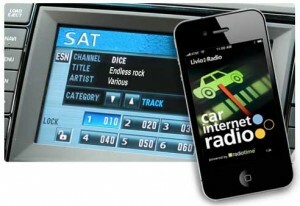 Bring your music to your car on your iPhone or Android smartphone. Listen to your music through your car speakers. We’ll show you the easiest way to get what you need, whether it’s an adapter or an upgrade of your current system. We sell special adapters from the leading manufacturers plus we offer upgrades to your car radio system so you can have the newest built-in technology in your dash without buying a new car! Sometimes it’s cheaper to replace an existing car radio with a new one than buying and installing adapters, plus you might just get better results. If you’re wanting to watch video from your phone on your car’s touchscreen the options can be more complicated. Read our article Ways to Connect Phone to Car Radio for some helpful information to connect iPhone or Android to car. Come into Our Store and Speak with a real Smartphone Integration Expert!